“Israel wants peace. I want peace. What we all want is a peace that will be genuine, that will hold, that will endure. And I think that the Eastern reality, and that the only – the only peace that will endure is one that is based on reality, on unshakable facts. “I think for there to be peace, the Palestinians will have to accept some basic realities. The first is that while Israel is prepared to make generous compromises for peace, it cannot go back to the 1967 lines, because these lines are indefensible, because they don’t take into account certain changes that have taken place on the ground, demographic changes that have taken place over the last 44 years. Remember that before 1967, Israel was all of 9 miles wide – half the width of the Washington Beltway. And these were not the boundaries of peace; they were the boundaries of repeated wars, because the attack on Israel was so attractive for them. “But a third reality is that the Palestinian refugee problem will have to be resolved in the context of a Palestinian state but certainly not in the borders of Israel. The Arab attack on Israel in 1948 resulted in two refugee problems; Palestinian and Jewish refugees, roughly the same number, were both expelled from Arab lands. Now tiny Israel absorbed the Jewish refugees, but the vast Arab world refused to absorb the Palestinian refugees. “Now, 63 years later, the Palestinians come to us and they say to Israel: accept the grandchildren, really and the great-grandchildren of these refugees, thereby wiping out Israel’s future as a Jewish state. Such blunt language, publicly directed at the President of the United States, is practically unprecedented. It was the precise and patient speech of a teacher to an ignorant student. The world often overlooks the refugee problem, caused by the continuing unwillingness of the Arab states to absorb the Palestinian refugees living among them. Many Palestinians falling into this category desire to retain their identity and status as a homeless population. Refugee camps, set up in 1948 and 1967, have been continually funded, both by the US and individual Arab states. The camps outside Israel have gradually been emptied; those inside Israel became the breeding ground for the Intifadas, the first of which came in December of 1987. When President Obama called for a return to the pre-1967 borders, it represented a radical reversal of US-Israel policy. It was a spectacle of virtual betrayal, representing a particularly dark day in international diplomacy, and the beginning of a steepening defense posture for Israel, feeling even more isolated than before. In his White House statement, Netanyahu was simply trying to restate the obvious elements of conflict that surround Israel. For the last 63 years, the tiny state has fought off innumerable invasions and terrorist acts, all designed to end the existence of the only parliamentary democracy in the Middle East. And at this season of the year, when July 4th rolls around and Americans celebrate our own Declaration of Independence, the Presidential statement is also an ironic denial of the very thing we have so often passionately fought and died for. The United States was born on the premise that a representative democracy, free of international threat, would provide the life intended by our Creator. Israel is based on the same premise. On the 29th of November 1947, the United Nations General Assembly voted to establish a Jewish, as well as an Arab state. Unfortunately, the proposed map of Israel was so dissected and twisted that peaceful coexistence became a virtual impossibility. 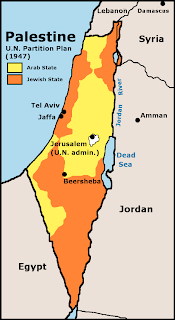 The new Jewish state was cut into three segments, excluding Jaffa and Jerusalem as well as Judea, Samaria and northcentral Israel. The Jews accepted the partition plan, but the Arabs vigorously rejected it, attacking Jewish settlements everywhere. Throughout December of 1947, as well as January and February of 1948, the Arabs continued an unending onslaught of attacks, large and small. Finally, in the wake of a battle for Jerusalem that raged between April 1st and mid-May, the United Nations granted Israeli statehood on May 14th, 1948. On the next day, May 15th, six Arab armies – Egypt, Syria, Transjordan, Lebanon, Saudi Arabia and Iraq – synchronized a mass invasion of Israel. In a rapid advance, they appeared on the verge of success in their goal of driving Israel into the Mediterranean Sea. But after ten days of fighting the Israelis mustered a successful counterattack. On the 11th of June, 1948, a truce was signed. But Israel was forced into a full-scale defensive posture, staving off a series of attacks between 1949 and 1967, and defending a country whose central portion averaged a ridiculously-slender ten to fifteen-mile width. It essentially begged the enemy to attack, since no real defense could be mounted. Finally, in the Arab attacks that culminated in the 1967 Six-Day War, Israel won full possession of the territory from Lebanon and the Golan Heights, all the way to the Suez Canal on the west, then southward to Sharm el Sheikh at the southern tip of the Sinai Peninsula. That was 34 years ago. Now, Israel is being asked to retreat to the borders they defended in that first war in 1949. However, the Arab League has acquired much military experience and many weapons. Between Hamas to the west and Hezbollah to the north, they face as many as 40,000 rockets, all of them secured in well-hidden and sometimes moveable launch zones. On the Sunday following Obama’s call for an Israeli retreat, he spoke before the annual assembly of the American Israel Public Affairs Committee (AIPAC). This appearance made it clear that he was concerned that his proposed formula for peaceful coexistence on the borders of Israel could cost him political support as he runs for re-election in 2012. In his address, he forthrightly repeated his view that peace talks should begin on the general premise that Israel’s only legitimate borders are the pre-1967 partition lines. It must always be remembered that Jerusalem was divided during that period. The great victory of the Six-Day War was the liberation and uniting of Jerusalem. The Temple Mount, the Old City, the Mount of Olives and much traditional Jewish territory became part of a united Jerusalem. A large part of the Obama proposal will divide Jerusalem once again, with the Temple Mount and Old City becoming contested territory. This directly confronts the Jerusalem Temple Institute, which has plans to establish a presence on the site of the First and Second Temples. “And in that day will I make Jerusalem a burdensome stone for all people: all that burden themselves with it shall be cut in pieces, though all the people of the earth be gathered together against it” (Zech. 12:2,3). Perhaps our President should more thoroughly apprise himself of the biblical view.